The political machinations that have recently forced an American university to cease operations in Hungary should serve as a warning about the growing global threat of authoritarian regimes, current school president and former Liberal leader Michael Ignatieff said Monday. Ignatieff said that the Central European University, a graduate institution founded by billionaire George Soros in 1991, has been "forced out" of the country by the current far-right government of Victor Orban, who has joined other like-minded politicians in blaming the+ U.S. philanthropist for Europe's migrant crisis. The university, which serves about 1,400 international students, has decided to move its U.S.-accredited degree programs from Hungary to neighbouring Austria next September after meeting with ongoing resistance from the Orban regime, said Ignatieff, the school's president and rector since 2016. Ignatieff, who spent a turbulent three-year tenure as leader of Canada's federal opposition between 2008 and 2011, said the fate of CEU should serve as a warning sign to all democratic countries including Canada. "This is a regime that...has gone after the courts, it's gone after the press, it's changed the constitution, it's gerrymandered the political system," Ignatieff said in a telephone interview. "There's a clear direction to what it's doing, and the attack on the university is just another stage in that process. I think Canadians should be concerned that democracy is under threat in Hungary." Ignatieff said fears for CEU's future in Hungary emerged last year during Orban's re-election campaign in which the four-time prime minister frequently levied attacks at the Hungarian-born Soros. Orban's government has conducted massive billboard and media campaigns against Soros blaming him for Europe's migrant crisis, a charge that Soros denies. In June, the parliament approved the "Stop Soros" law, which allows criminal penalties of up to a year in prison for those convicted of aiding asylum-seekers. The pro-democracy philanthropist has also been criticized by U.S. President Donald Trump and vilified by right-wing conspiracy theorists. Ignatieff said the Orban government imposed a host of new requirements for the university to meet in order to keep operating as an international graduate school in Budapest. One new rule, for instance, required CEU to prove it had a campus in place in the U.S. Ignatieff said the school established educational programs with New York's Bard College to comply with the rule. But he said the Orban government would not accept CEU's moves and ultimately refused to sign an agreement necessary to let it continue as a U.S.-accredited institution in Budapest. Ignatieff noted a certain irony in the situation given CEU's origins as an anti-communist university. "This is an institution founded to assist the society transition out of single-party rule. We're being driven out of Hungary by a government that is consolidating single-party rule," he said. "This is a story about what happened to the transition from communism. It didn't go in the direction that anybody expected." 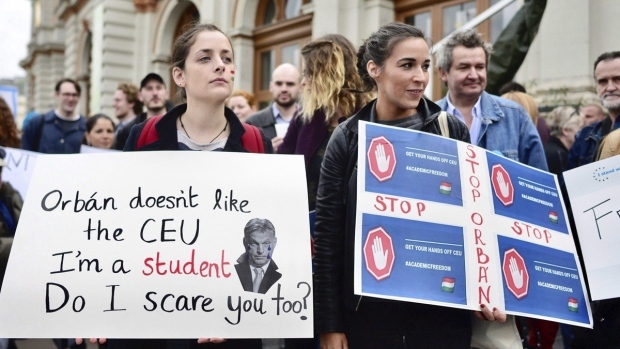 Hungary's fight with CEU is widely seen as part of a more comprehensive crackdown on academic freedom, including tighter budgetary and research controls over Hungarian universities. In October, for example, the government eliminated gender study programs at public universities. Ignatieff said Hungary is not the only country to see many democratic rights swept away by the current regime, saying authoritarian governments in other European countries, including Poland, point to an alarming global trend. It's one he said Canadians should monitor with caution. "Canadians take their democracy for granted, but they shouldn't," he said. "Democracy is not secure, and it's not secure in this part of Europe. In the 21st century no place is very far away, and what starts in one place can easily spread to many places." Incoming students in CEU's masters and doctoral programs will start studying at the Vienna campus in the 2019-2020 academic year, while students already enrolled may remain in Budapest to complete their degrees.